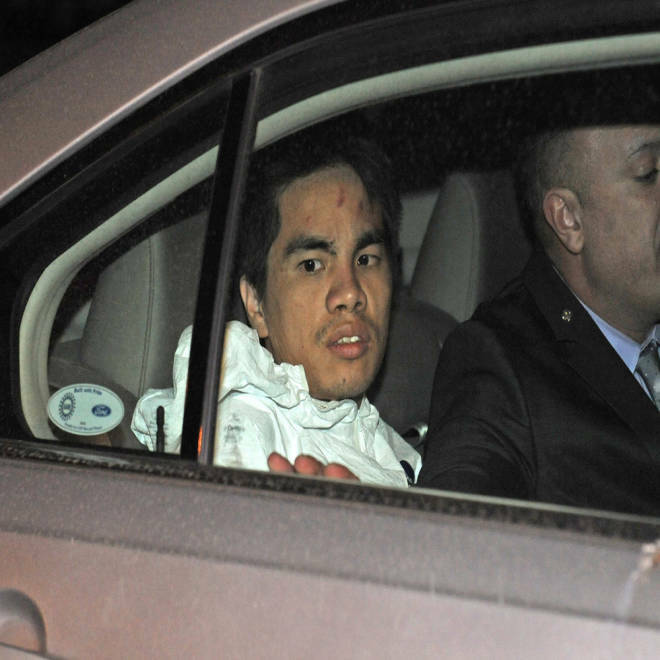 Mingdong Chen, a suspect in the murder of five people in Brooklyn's Sunset Park neighborhood, is taken by police from the 66th precinct on Sunday. When relatives of a Chinese immigrant mother of four young children banged on the family's door, it opened to a grisly sight: a man dripping with human blood who is now charged with stabbing the five to death with a butcher knife. Mingdong Chen, 25, faced five counts of murder Sunday, a day after the brutal killings of his cousin's wife and her four children in Brooklyn's Sunset Park neighborhood. Two girls, 9-year-old Linda Zhuo and 7-year-old Amy Zhuo, were pronounced dead at the scene, along with the youngest child, 18-month-old William Zhuo — all found in a back bedroom, police said. Their brother, 5-year-old Kevin Zhuo, and 37-year-old mother, Qiao Zhen Li, were found in the kitchen and taken to hospitals, where they also were pronounced dead. The five "were cut and butchered with a kitchen knife," said Chief of Department Philip Banks III, the New York Police Department's highest-ranking uniformed member. The victims died of stab wounds to their necks and torsos, and Chen has implicated himself in the killings, Banks said. "It's a scene you'll never forget," he added. Chen had been staying with the family on the first floor of the two-story brick house for about a week. He was unemployed after being fired from a string of restaurant jobs he couldn't hold down for more than a few weeks at a time, according to neighbors and relatives in the working-class neighborhood dominated by a large community of immigrants from China. Almost a decade after coming to the United States as a teenager, he still was fluent only in Mandarin Chinese, Banks said. "He was bouncing around," said Banks. Chen apparently was jealous of fellow immigrants' successes in America. "He made a very soft comment that since he came to this country, everybody seems to be doing better than him," Banks said. The children's father, his cousin, was not home late Saturday evening; he was working at a Long Island restaurant, one neighbor said. 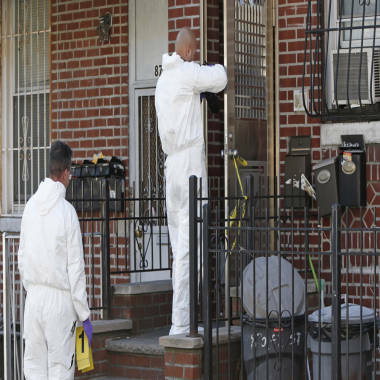 Crime scene detectives investigate the scene of a multiple fatal stabbing on Sunday in New York. The mother tried to call him because she was alarmed about Chen's "suspicious" behavior earlier in the evening, Banks said. When she couldn't reach her husband, Li called her mother-in-law in China, who also could not immediately reach her son. The mother-in-law then reached out to her daughter in the same Brooklyn neighborhood, Banks said. The sister-in-law and her husband went to the house at about 11 p.m. and kept banging on the door till someone answered, police said. It was Chen, "and they see that he's covered with blood," Banks said. "They don't know who this person is." The couple fled, called 911, and detectives investigating another matter nearby responded quickly, Banks said. Yuan Gao, a cousin of the mother, came by the house Sunday and stood on the tree-lined street with well-tended row houses, half a block from the neighborhood thoroughfare, its open air markets, Chinese restaurants and shops bustling with Sunday morning shoppers. Many walked over to the house, milling around and discussing the most horrible crime they could remember. But almost none spoke English, and the few who did remained tight-lipped. Some said that at Chen's last temporary home, days before the killings, late-night arguments were loud enough to be heard outside. Gao said Chen was emotionally unstable — a factor contributing to his repeated firings. She said he had moved to the area recently and was staying with whoever would take him for brief periods of time. Bob Madden, who lives a block away, was walking his dog on Saturday night when he saw the young man being taken away in a police cruiser. "He was barefoot, wearing dungarees, and he was staring, he was expressionless," Madden said. The suspect was in custody Sunday, but is still awaiting arraignment. It was unclear whether he had an attorney. Banks said Chen had at first resisted arrest and, while being processed, assaulted a police officer. "The father was freaking out," she said. "He just came home from work and saw the police and they told him. He was hysterical."